Photo by: Leisure Arts, Inc. I am a huge fan of waves, ripples, and chevrons. I love making afghans and other items with beautiful ripple patterns. 154 Crochet Wave Patterns contains some really great patterns to fit any style and any skill level. There are chevrons, ripples, shells, granny stitches, popcorn stitches, lacy patterns and more! Every stitch pattern begins with notes about the color sequence, special stitches, and multiples to change the size of the pattern. At the end of the book, there is a great list of abbreviations, tips on working with multiples, and photo tutorials for special techniques. Posies in a Row – a beautiful chevron pattern with cluster stitches that look like flowers. Woven Ribbons – a gorgeous ripple with just a pop of color that resembles ribbon woven through it. Spaced Popcorns Chevron – a simple ripple with hints of popcorn stitches throughout. Row 1: 2 dc in fourth ch from hook. *Sk next 3 chs, (sc, ch 3, 3 dc) in next ch. * Repeat from * to ** across until there are 4 chs left. Sk 3 chs, sc in last ch. Ch 3, turn. Row 2: 2 dc in first sc, sk next 3 dc, sc in the next ch, ch 3, 3 dc in ch-3 sp. *Sk next 4 sts, sc in next st, ch 3, 3 dc in ch-3 sp** Repeat from * to ** across to the last 4 sts. Sk next 3 sts, sc in last st. Ch 3, turn. Row 26-27: Repeat Row 2. Row 28-29: Repeat Row 2. Row 30-31: Repeat Row 2. Row 32-33: Repeat Row 2. Row 34-53: Repeat Row 2. Row 54: 2 dc in first sc, sk next 3 dc, sc in the next ch, ch 3, 3 dc in ch-3 sp. *Sk next 4 sts, sc in next st, ch 3, 3 dc in ch-3 sp** Repeat from * to ** across to the last 4 sts. Sk next 3 sts, sc in last st. Fasten off, leave long tail for sewing (about 6-8 inches). Join edges of cowl together (I tried to interlock the points) and sew together using the tail end of yarn and a yarn needle with a whip stitch. If you have any questions or love the project, leave me a comment! 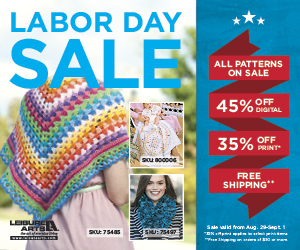 Don’t forget to check out the HUGE Leisure Arts Labor Day Sale! Stock up on your favorite books and patterns and get Free Shipping! Hurry because the sale ends on September 1st! What a beautiful shawl. Thank you for sharing your creativity. Love it! I’m making one for this winter! I love the stitch design on this cowl! I love making cowls but this one I can’t wait to make for my oldest granddaughter! I love this stitches! I love the cowl! Those colors are quite perfect. Is there a link to the woven ribbons stitch? Beautiful cowl! I made this for a customer of mine. Thank you for sharing this pattern!